Type W Air Filters - Airsan Corp.
Airsan Type W filters are manufactured to deliver consistent, durable performance in turbine generators, power plants, wind turbines and offshore oil rigs, as well as military submarines and surface vessels. These are viscous-impingement filters, engineered to manage high airflow velocities in air handling equipment used in heating, cooling and ventilation systems. They are also ideal for demisting applications and can be applied either at the air intake or in the airstream after-coils. Airsan Type W filters are available in 2”, 4” or customized nominal thickness and fabricated with galvanized steel frame and media. Other materials are also available for specialized applications, including bronze, stainless steel and aluminum. AIRSAN TYPE W FILTERS ARE MANUFACTURED TO DELIVER CONSISTENT, DURABLE PERFORMANCE IN TURBINE GENERATORS, POWER PLANTS, WIND TURBINES AND OFF SHORE OIL RIGS, AS WELL AS MILITARY SUBMARINES AND SURFACE VESSELS. 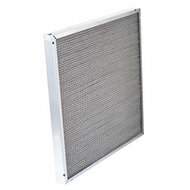 TYPE W FILTERS ARE VISCOUS-IMPINGEMENT FILTERS, ENGINEERED TO MANAGE HIGH AIRFLOW VELOCITIES IN AIR HANDLING EQUIPMENT USED IN HEATING, COOLING AND VENTILATION SYSTEMS. TYPE W FILTERS ARE ALSO IDEAL FOR DEMISTING APPLICATIONS AND CAN BE APPLIED EITHER AT THE AIR INTAKE OR IN THE AIR STREAM AFTER-COILS. TYPE W FILTERS ARE AVAILABLE IN EITHER A 2”, 4” OR CUSTOMIZED NOMINAL THICKNESS AND FABRICATED WITH GALVANIZED STEEL FRAME AND MEDIA. WE CAN ALSO OFFER YOU A CHOICE OF MATERIALS FOR SPECIALIZED APPLICATIONS THAT INCLUDES BRONZE, STAINLESS STEEL OR ALUMINUM.